slightly adapting the strategy to different assets, and - while live trading - to the current market regime. Training a strategy involves testing a set of strategy parameters with historical or recent price data, and finding the most stable or the most profitable parameter values, dependent on optimization algorithm. For example, imagine a trading system that buys and sells a position when the price curve crosses its n-bar Simple Moving Average. This strategy can be trained to find the optimal value of n between 20 and 200. For this purpose, most trade platforms come with a genetic or brute force optimizer for finding the highest performance peak in the parameter space. Zorro's optimize function works differently. It does not seek performance peaks; instead it looks for stable performance ranges and places the parameters into their centers. This does not necessarily result in the maximum backtest performance, but in the highest likeliness to reproduce the hypothetical performance in real trading. For special purposes, a genetic or brute force optimization can be activated by setting a TrainMode flag. If the strategy uses a machine learning algorithm, such as a neural net or decision tree, training has a different purpose. It feeds the algorithm with historical market data or data from other sources, and allows it to learn predicting the market. This process is repeated in intervals for keeping the learning algorithm up to date. This is rules training, as opposed to parameter training. Since rules training bears a high danger of overfitting, counter measures as described below are mandatory. The displayed values per line are the loop and parameter number, the optimization step, the parameter value, the result of the objective function, and the number of winning and losing trades. In [Train] mode, trades usually open 1 lot, regardless of Lots or Margin settings. The results are summed up over all sample cycles. Pool trades are not used, and phantom trades are treated like normal trades. This behavior can be modified in special cases by setting the Optimize variable. The optimal parameters are stored in a *.par file in the Data folder, and are automatically used by Zorro when testing or trading the system. Parameters are optimized and stored separately per asset and algorithm in a portfolio system; therefore all optimize calls must be located inside the asset/algo loop if there is any. When the FACTORS flag is set, capital allocation factors are also generated and stored in a *.fac file in the Data folder. When the strategy contains advise calls and the RULES flag is set, decision tree or perceptron rules are generated and and stored in *.c files in the Data folder. If external machine learning functions are called, the trained models are stored in *.ml files in the Data Folder. In [Train] mode, trades usually open 1 lot, and pool and phantom trades are converted to normal trades. By setting flags accordingly, parameters, factors, and rules can be generated either together or independent of each other. The charts are stored in the Log folder and end with the number of the parameter, f.i. _p1 for the first, _p2 for the second parameter and so on. The red bars are the result of the objective function, which is by default the profit factor of the training period, corrected by a factor for preferring a higher number of trades. 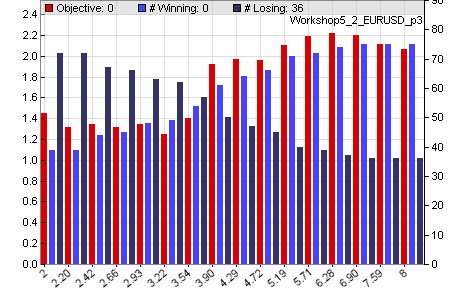 The dark blue bars show the number of losing trades and the light blue bars show the number of winning trades. In walk forward optimization, the charts display the average results over all WFO cycles. Training is critical and should not be omitted even when a strategy appears to be already profitable with its default parameters. Most strategies only work within certain parameter ranges. Those ranges are usually different for every asset and also vary with the market situation - a bullish or bearish market has different optimal parameters than a market with no trend. Due to the asymmetry of most markets, long and short trades often also require different parameters. Naturally, parameters can only be optimized to a specific historical price curve, therefore they perform best with that particular price curve and will perform not as good with any other data - such as real time prices in live trading. This effect is called overfitting. It varies with the strategy, and is discussed below. Select carefully the parameters that you train. Parameters that are fundamental to the strategy - for instance, the market opening hour when the strategy exploits the overnight gap - must never be trained, even if training improves the test result. Otherwise you're in danger to replace a real market inefficiency by a random training effect. This method divides the price data into one-week segments (a different segment length can be set up through DataSkip). Usually two of every three weeks are then used for the optimization, and every third week is skipped by the optimization and used for the strategy test. The LookBack period is the part of the price curve required by the strategy before the first trade can be entered, for functions that use past price data as input, such as moving averages or frequency filters. Thus a preceding lookback period must be cut off from the start of the data for both training and testing. Horizontal split optimization is the preferred training method for quick tests while developing the strategy, or for testing when you don't have much price data. It is the fastest method, uses the largest possible data set for optimization and test, and gives usually quite realistic test results. For checking the consistency you can test and train also with different split combinations, f.i. SKIP1 for training and SKIP2+SKIP3 for testing. The disadvantage is that the test, although it uses different price data, runs through the same market situation as the training, which can make the result too optimistic. Alternatively, you can select only a part of the data period - such as 75% - for training. The rest of the data is then used exclusively for testing. This separates the test completely from the training period. Again, a lookback period is split off for functions that need past price data. Vertical split optimization has the advantage that the test happens after the training period, just as in live trading. The disadvantage is that this restricts testing to a small time window, which makes the test quite inaccurate and subject to fluctuations. It also does not use the full simulation period for optimization, which reduces the quality of the parameters and rules. The parameters and rules are stored separately for every cycle in files ending with "_n.par" or "_n.c", where n is the number of the cycle. This way the strategy can be tested repeatedly without having to generate all the values again. The test cycle is divided into (n-1) test periods that use the parameters and factors generated in the preceding cycle. The last training cycle has no test period, but can be used to generate parameters and rules for real trading. The WFO test splits the test period into several segments according to the WFO cycles, and tests every segment separately. The test result in the performance report is the sum of all segments. The parameters from the last cycle are not included in the WFO test as they are only used for real trading. A special OOS test can be used for out-of-sample testing those parameters with price data from before the training period. WFO can be used to generate a 'parameter-free' strategy - a strategy that does not rely on an externally optimized parameter set, but optimizes itself in regular intervals while trading. This makes optimization a part of the strategy. WFO simulates this method and thus tests not only the strategy, but also the quality of the optimization process. Overfitted strategies - see below - will show bad WFO performance, profitable and robust strategies will show good WFO performance. The disadvantage of WFO is that it's slow because it normally runs over many cycles. Like vertical split optimization, it uses only a part of the data for optimizing parameters and factors. Depending on the strategy, this causes sometimes worse, sometimes better results than using the full data range. Still, WFO is the best method for generating robust and market independent strategies. Another advantace of WFO is that the training time can be strongly reduced by using several CPU cores. Training rules and parameters at the same time only works with single assets, not with a portfolio system that contains loops with asset or algo calls. If required, train all portfolio components separately and combine the resulting .c files. The Combine.c script can be used as a template for automatically combining parameters and rules from different assets or algos. Machine learning models (.ml files) can be combined with an appropriate R function. With Zorro S, the process can be automatized with a batch file. Before training a system the first time, make sure to run a [Test] with the raw, unoptimized script. Examine the log and check it for error messages, such as skipped trades or wrong parameters. You can this way identify and fix script problems before training the script. Training won't produce error messages - trades are just not executed when trade parameters are wrong. The strategy script. It contains the basic trade rules, is written by the user, and stored in the Strategy folder. It either has the file name *.c (the * stands for the strategy name) or *.x, dependent on if it's in lite-C or compiled to executable machine language. Compiled scripts start faster, and can be used to hide the underlying souce code (the included Z strategies are compiled). The strategy script is the only file that is really required for a trade strategy, and 90% of this documentation is for learning how to write it. The 3 other files are optional. The strategy parameters. They are generated by optimize calls when training a strategy. They are stored in Data\*.par. This file contains the parameters in the order they appear in the script. If the strategy does set up the asset itself, training generates different parameter files dependent on the asset selected in the [Asset] scrollbox. The OptimalF capital allocation factors, either one file per WFO cycle or a single file for the whole simulation. Capital allocation factors tell Zorro how to distribute the capital among the trades, dependent on the assets and trade rules. They are automatically generated in a training run, but can also be manually edited by the user. They are stored in Data\*.fac. The trade rules and models, generated by the advise function. Rules are small scripts that contain lite-C functions, stored in Data\*.c. Models generated by external machine learning algorithms are stored in Data\*.ml. All 4 files, except for the executable *.x and the *.ml machine learning models, are normal text files and can be edited with any plain text editor. Keep strategies simple and don't use too many parameters, filters, and extra conditions. A strategy should not use more than 3 optimized parameters for entering trades and another 3 for exiting them. Too many parameters increase the likeliness of overfitting, and will cause worse results in WFO and in real trading. While developing the strategy, check out which parameters are best candidates for optimization. Optimize only those that largely afffect the strategy performance. Check out the parameter charts. They give valuable information about the effect of a parameters. Don't use a parameter that does not generate a 'broad hill', but instead narrow peaks, single lines, or a chaotic parameter performance chart. Keep the optimize ranges small, as large ranges tend to produce 'local maxima' and generate an overfitted strategy. For the same reason, do not use too small optimize steps. Dependent on the range and importance of the parameter, don't select steps smaller than 5% to 10% of the parameter range. Optimize entry parameters first and exit parameters afterwards. When your exit system is complex, optimize entry parameters with a simplified exit such as a simple stop. For using a simple exit while the entry parameters are optimized, evaluate the current parameter number (ParCycle), f.i. if(Train && ParCycle <= NumParameters-3) setExitSimple();. Do not optimize parameters more than twice, i.e. NumOptCycles should not exceed 2. Higher values increase the danger of overfitting. Get enough trades for optimizing. 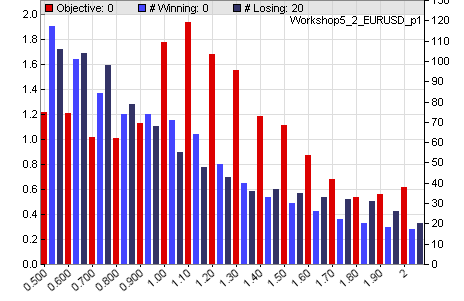 The more trades are simulated, the better is the quality of the parameter and rule set. 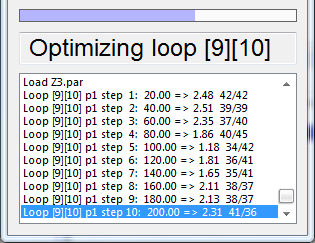 Set NumYears accordingly, and don't use too many WFO cycles with too small optimization periods. As a rule of thumb, you should have at least 20 trades per parameter and asset. Use oversampling for generating more trades from different price curves with resampled bars. Always use different price data for [Train] and [Test] mode by using WFO or setting DataSplit or SKIP1, SKIP2, SKIP3 accordingly.